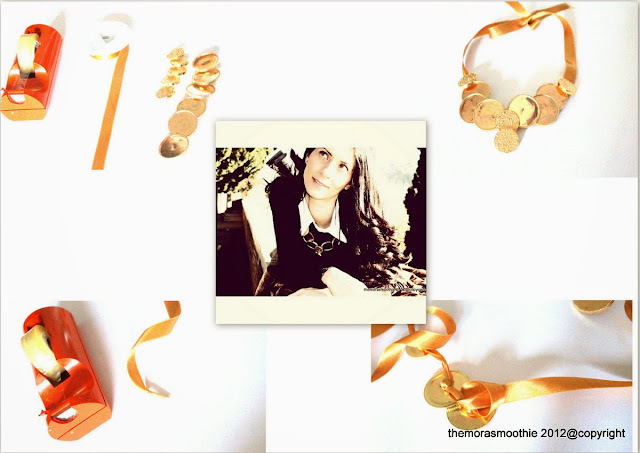 The Mora Smoothie fashion blog, DIY fashion by Paola Buonacara: Golden buttons DIY necklace! Today's DIY is a tutorial about the necklace that you saw here, an easy idea as a gift too, it got little time, you just need some nice buttons and tape. Now let's see how I made, I simply wrapped the ends to pass in the buttons with adhesive-tape, to make easier the job and then I had stuck with a knot every button and tried to stack them. What do you say, it isn't a nice idea?!?! Oggi il tutorial del DIY della collana che avete visto qui, una semplice idea anche come regalo, il tempo è veramente pochissimo, servono solo dei bei bottoni particolari e del nastro. Vediamo come ho fatto, ho semplicemente avvolto l'estremità da passare nei bottoni con del nastro adesivo, per rendere più agevole il lavoro e poi ho bloccato ogni bottone con un nodo ed ho cercato di sovrapporli. Che ne dite' non è una simpatica idea?!?! Un bacio grande grande e sempre grazie di esserci e soprattutto grazie per le vostre mail sempre bellissime! Nice necklace design. I likes necklaces very much. It was so nice. Thank you for sharing the wonderful one. I really thankful to you. You can do it a great job, well done. I can see that you can do a hard work for the presentation of this blog. Well done. We are also wait for yours others presentations. Also visit Custom essay writing service. I have seen it,it is Great.Thanks..!! Outfit in a warm December day with my new DIY! Outfit with new DIY necklace in a Sunny Day! My new DIY shoes inspired by Chanel! Photo-shooting with Palens Sunglasses by AMwood! DIY bracelet inspired by Versace! #MercedesBenzShow The Stars were here!